We have assembled below several prominent, freely available studies of special economic zones and related institutions. WEPZA does not necessarily endorse or agree with the views and research contained in these materials. We have merely provided them to help share and spread knowledge on zones with the public. This comprehensive paper by the Multi-Donor Investment Climate Advisory Services of the World Bank Group (FIAS) "examines 30 years of experience in zones, reviewing development patterns and economic impacts of zones worldwide. The experience shows that while zones have been effective in addressing economic growth and development objectives, they have not been uniformly successful; successes in East Asia and Latin America have been difficult to replicate, particularly in Africa, and many zones have failed." WEPZA's current Secretary-General Jean-Paul Gauthier was, while still with BearingPoint in 2002-2004, the Project Manager of the research project under which this study was written for FIAS. He was subsequently, while at FIAS from 2004-2007, responsible with Samir Stewart for seeing to the updating of its findings, which relied heavily on proprietary database information provided on a courtesy basis by WEPZA's Doug Bolin. Ask three people to describe a special economic zone (SEZ) and three very different images may emerge. The first person may describe a fenced-in industrial estate in a developing country, populated by footloose multinational corporations (MNCs) enjoying tax breaks, with laborers in garment factories working in substandard conditions. In contrast, the second person may recount the 'miracle of Shenzhen,' a fishing village transformed into a cosmopolitan city of 14 million, with per capita gross domestic product (GDP) growing 100-fold, in the 30 years since it was designated as an SEZ. A third person may think about places like Dubai or Singapore, whose ports serve as the basis for wide range of trade- and logistics-oriented activities. 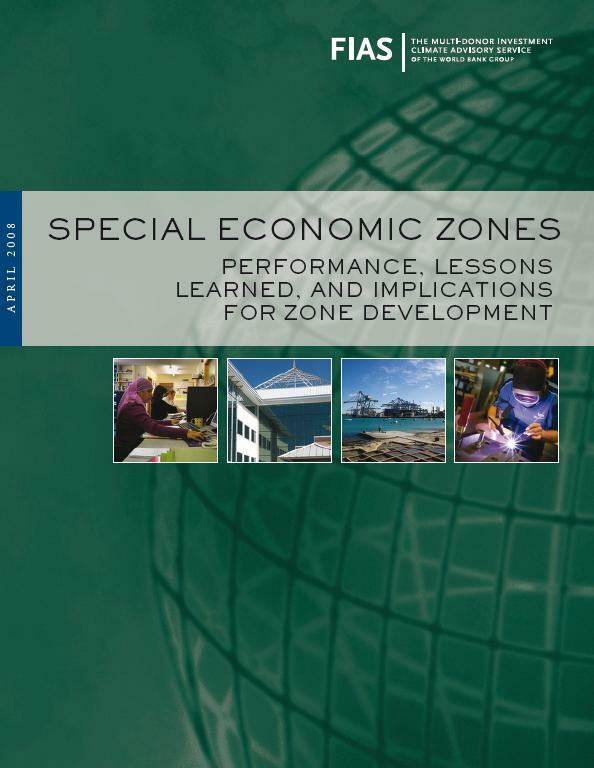 In this book, the author use SEZ as a generic expression to describe the broad range of modern economic zones discussed in this book. But we are most concerned with two specific forms of those zones: (1) the export processing zones (EPZs) or free zones, which focus on manufacturing for export; and (2) the large-scale SEZs, which usually combine residential and multiuse commercial and industrial activity. The former represents a traditional model used widely throughout the developing world for almost four decades. The latter represents a more recent form of economic zone, originating in the 1980s in China and gaining in popularity in recent years. 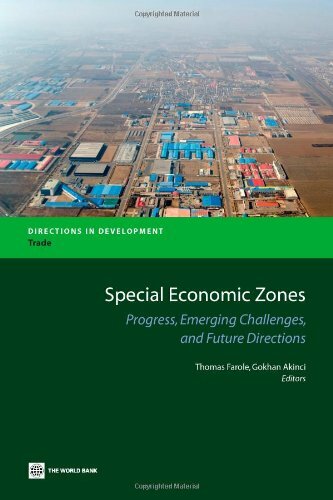 Although these models need not be mutually exclusive (many SEZs include EPZ industrial parks within them), they are sufficiently different in their objectives, investment requirements, and approach to require a distinction in this book. China's meteoric economic rise over the past three decades is an unprecedented "growth miracle" in human history. Since the Open Door policy and reforms that began in 1978, China's gross domestic product (GDP) has been growing at an average annual rate of more than 9 percent, with its global share increasing from 1 percent in 1980 to almost 6.5 percent in 2008 and its per capita GDP increasing from US$193 to US$3,263. Total exports have been growing at an average annual rate of 13 percent (21.5 percent from 1998 to 2007), with China's share of total exports increasing from 1.7 percent in 1980 to 9.5 percent in 2008. In 2007, China's incremental growth in real GDP actually exceeded its entire real GDP in 1979. In 2010, China is set to outpace Japan and become the world's second-largest economy. China has indisputably become an important growth engine of the global economy and a leader in international trade and investment. Rapid growth in the past decades has helped lift more than 400 million people out of poverty. These results are truly impressive. While China's rapid rise has become a hot topic for development debate among policy makers, business people, and scholars all over the world, the numerous special economic zones (SEZs) and industrial clusters that have sprung up since the reforms are undoubtedly two important engines for driving the country's growth. "First, we find that project designs overestimate the intellectual clarity of the agglomeration approach. There have been many implementation challenges, resulting in unsatisfactory ratings for several projects. We argue that greater efforts should be made to reduce technical complexity (including the number of activities and institutions involved), to build institutional capacity, and to make projects flexible. Looking forward, agglomeration projects may benefit from being designed as a series of incremental projects, by which lending can be carried out in stages to reflect changing realities on the ground. Second, there are important second-order effects, including the impact of projects on asset prices, notably land which needs to be incorporated into assessing project outcomes. Agglomeration projects and local investment can have a large effect on land values, raising issues of ownership, control, and allocation. Finally, while agglomeration may ease coordination failures and induce a critical mass of private firms to enter and invest, this does not always occur. Some threshold (in terms of lower costs and risk) may need to be reached to spur private investment. This threshold concept has not been incorporated into the current linear results framework (input to output to outcome); further experimentation is needed to develop flexible results frameworks that explicitly recognize this threshold effect." Special Economic Zones have been widely used internationally to attract foreign direct investment, alleviate large-scale unemployment, and develop and diversify exports. In November 2011, the Centre for Development and Enterprise hosted a Round Table focused on the potential of SEZs to accelerate economic growth and job creation in South Africa. 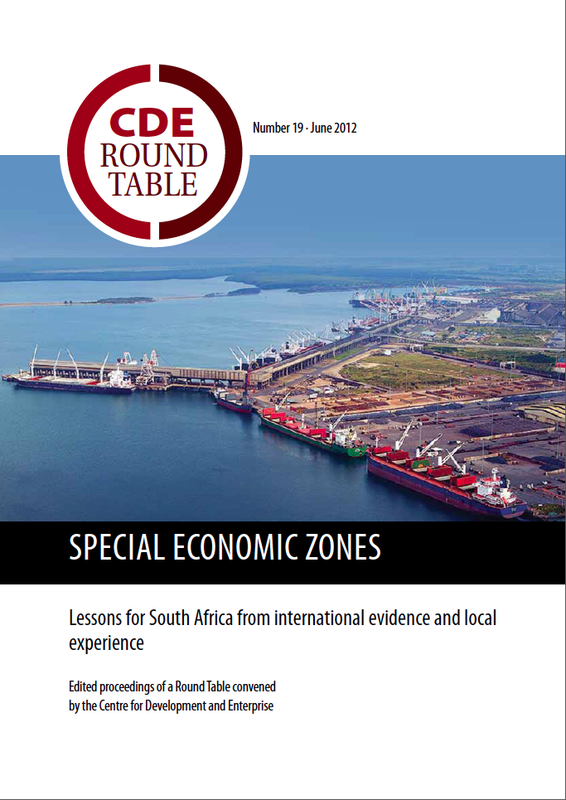 SPECIAL ECONOMIC ZONES: Lessons for South Africa from international evidence and local experience summarises the Round Table proceedings. Jean-Paul Gauthier, Secretary-General of WEPZA, and Claude Baissac, WEPZA Advisory Board Member and former Secretary-General, offered instrumental advice to the CDE for this study. African Shenzhen: China's special economic zones by Deborah Bräutigam* and Tang Xiaoyang in Africa, J. of Modern African Studies, vol. 49.1, pp.27–54 (2011). This article examines recent Chinese efforts to construct a series of official economic cooperation zones in Africa. These zones are a central platform in China’s announced strategy of engagement in Africa as ‘mutual benefit'. We analyse the background, motives and implementation of the zones, and argue that they form a unique, experimental model of development cooperation in Africa: market-based decisions and investment by Chinese companies are combined with support and subsidies from an Asian ‘developmental state’. Though this cooperation provides a promising new approach to sustainable industrialisation, we also identify serious political, economic and social challenges. Inadequate local learning and local participation could affect the ability of the zones to catalyse African industrialisation. The synergy between Chinese enterprises, the Chinese government and African governments has been evolving through practice. A case study of Egypt provides insight into this learning process. Moving Companies: How U.S. Engineering Consulting Firms Created the Global Assembly Line, 1949–1969, by Eda Kranakis, Workshop on Global Perspectives on Engineering, sponsored by the International Network of Engineering Studies, hosted by Maria Paula Diogo, New University of Lisbon, Portugal 14-15 October, 2008. This working paper tracing the history of export processing zones (EPZs) and the role of American engineering firms in developing them. View power point presentations presented by WEPZA at various conferences around the world. Ishita Dey, The Emerging Scenario of Citizenship: Case of Special Economic Zones in India (2010). Nicolas Papadoupoulos and Shavin Malhotra, Export Processing Zones in Development and International Marketing: An Integrative Review and Research Agenda, Journal of Macromarketing Vol. 27 No. 2 (June 2007). Resource Book, Migration in the Greater Mekong Subregion (2013) - An in-depth study by the Mekong Migration Network and the Asian Migrant Centre on the role of border economic zones on migration in South East Asia. The Political Economy of Special Economic Zones by Lotta Moberg in the Journal of Institutional Economics (2014).